Hey babe! I am so excited you stopped by! 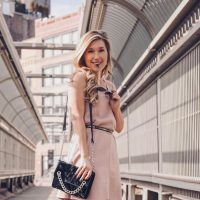 Welcome to simply e l l, a platform for me to share all things about, well, Me! Actually, not specifically about me, so much as what inspires me every day. My goal is to provide you with content that sheds light on all parts of a modern-day women’s life; which include fashion & style, life & love, beauty & health, and a whole lot more. A little about me – I am Erica, the voice behind simply e l l. I was born and raised in a suburban town outside of Philadelphia, PA, where I now currently live with my boyfriend, Shane. Aside from being a complete Harry Potter nerd, I am a huge animal lover, a die hard West Virginia University fan (Let’s GO! ), and Chick-fil-a enthusiast. By day, I work at a medical insurance brokerage firm, but by night, am the influence and soul behind simplyell.com. In my opinion, whether you are having a movie night with the babe, or about to leave for a girls night out, picking your look should be F-U-N. I also find that no matter the occasion, you can add a flair of style to any look. With all of that said, this is how the blog was born! Today, simply ELL serves as fun and modern resource for women to transform and update their lifestyles so they live each day in style. From creating the perfect look, trying out a new beauty regimen, or simply trying to work on some personal goal, simply ell is a source for inspiration and support. Thank you so much for stopping by, and I hope to see you back again soon! Always feel free to reach out to me directly at simplyellstyle@gmail.com, or follow along on Instagram, twitter, and Pinterest!